I made this little one for my niece. I didn't want to give it to her as she is covered in even more 'Moonies'. (I still haven't worked out where I'm going wrong with this) They are mainly on the back of her head so I'm wondering if the wipes I'm using to rest her on during the cooking stage are too wet. I'll try something different next time. I left the naming to my niece and, after much thought, she decided to call her Joy. A lovely name. ...and a full length shot. 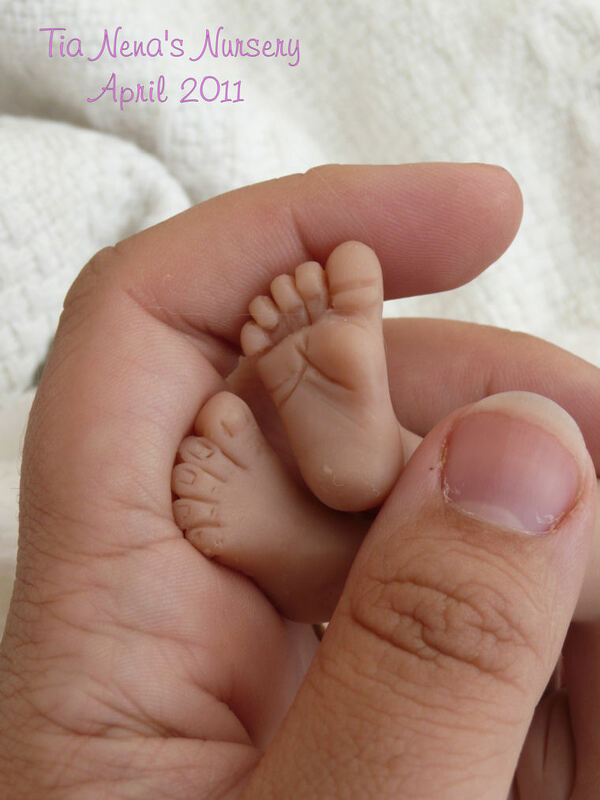 I was especially pleased with Joy's little toes. I'm itching to get sculpting again as it's been a while. Hopefully some cuties... we'll see! Hi folks! 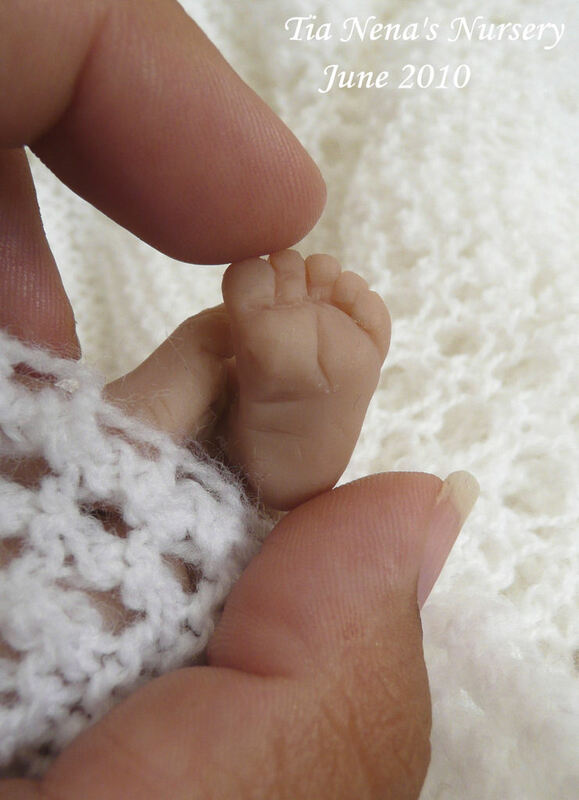 Introducing little baby Louisa. 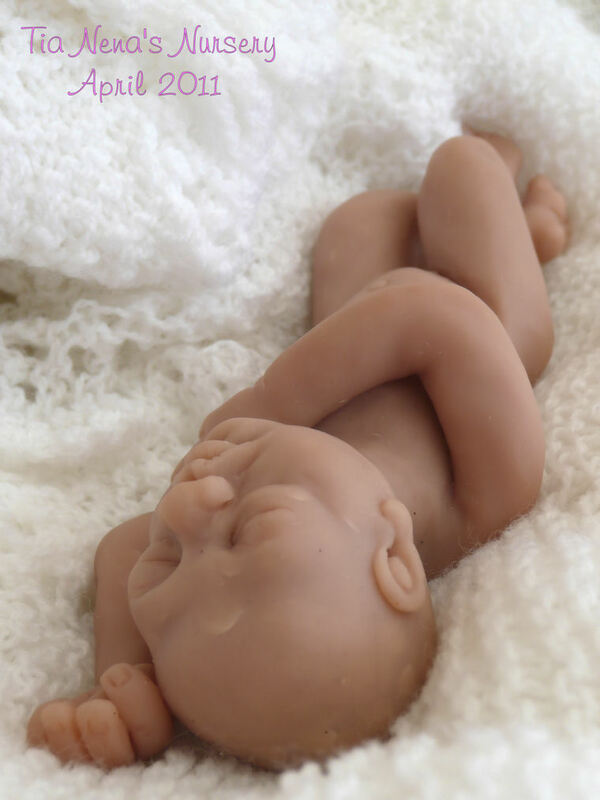 The first baby I have sculpted on my own at home. I followed the great tutorial notes that I bought home from the Cath Roberts class I attended. At the class I picked up lots of hints and tips. The ladies kept talking about 'moonies', which I chuckled at.... the image of peep's flashing their bottoms out of car windows keep popping into my mind. But I know what they are talking about now as little Louisa has a couple on her head! If anyone has any suggestions on how to avoid them/get rid of them please let me know. I'm looking forward to some cooler weather to do some more sculpting. 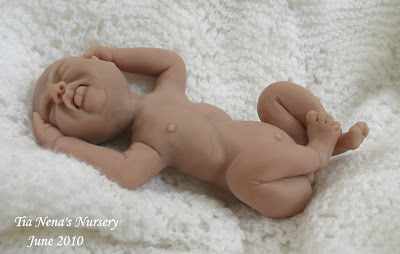 I'm finding it a little difficult to handle the clay when it's too hot. ...and really dinky. Louisa is anatomically correct. Here's a full view of Louisa. 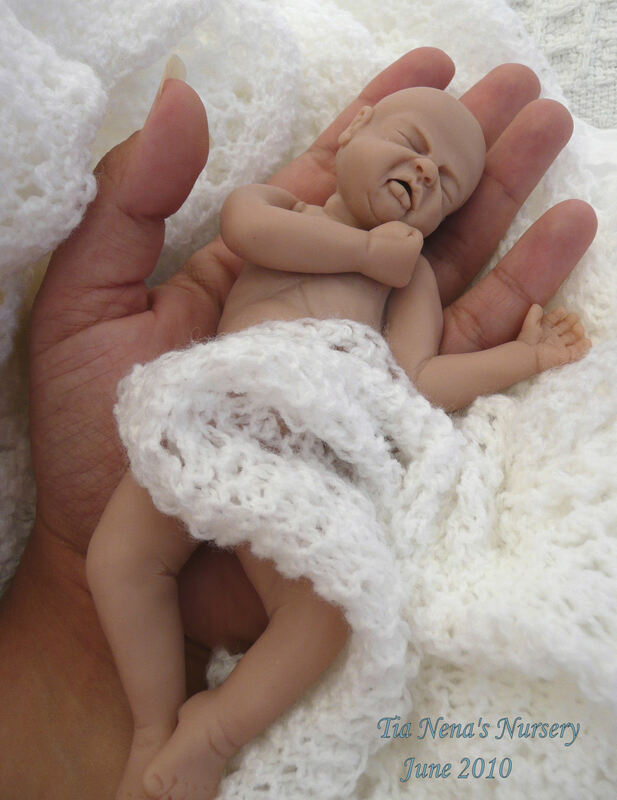 ...and a couple of pictures of her in my hand so you can see the scale. I hope you like baby Louisa. Hi folks! 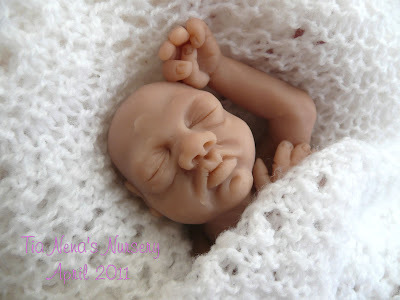 ....and welcome to my new blog dedicated to one of a kind (OOAK) mini baby sculpts created by me. 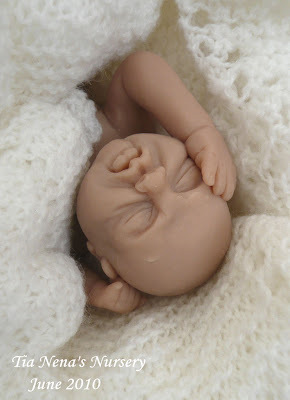 Introducing precious little Peter, my very first OOAK mini baby sculpt. 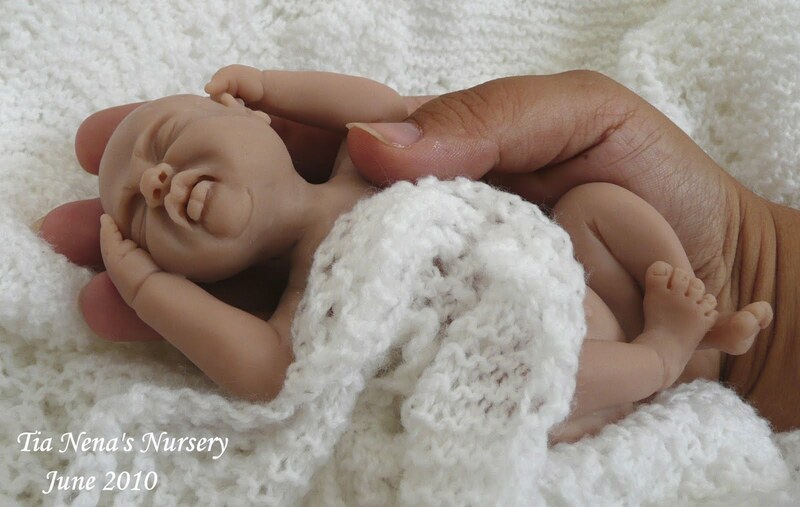 In April this year I stumbled across OOAK dolls on Ebay and just had to find out more about them. I did a bit of research on the Internet, bought some magazines and found out about the Discover Dolls international show to be held in Peterborough in June. 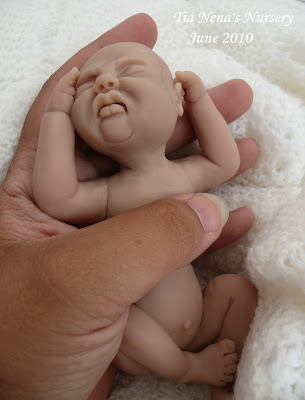 Reborn Artist and Sculptor Cath Roberts was teaching a class on how to sculpt a mini baby which I just had to attend. 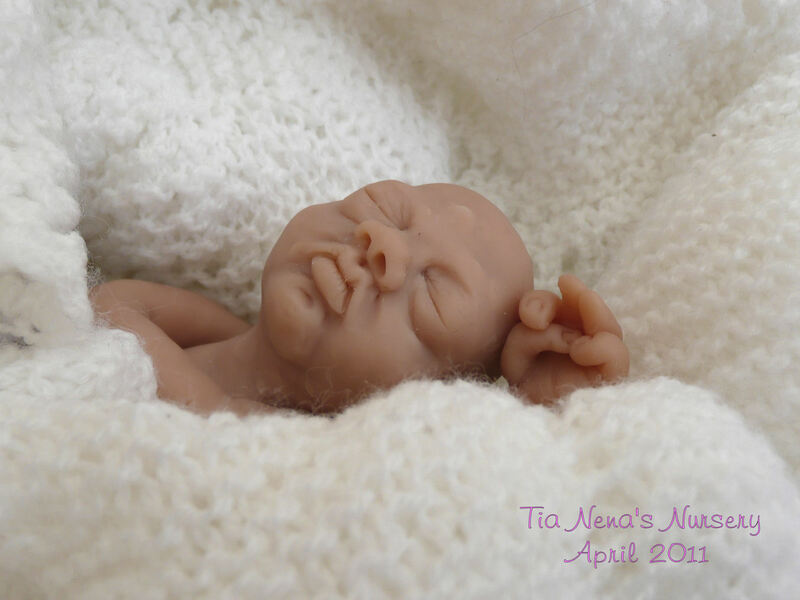 My precious little Peter (Peterborough influenced the name) was completed on the day. The class was amazing! 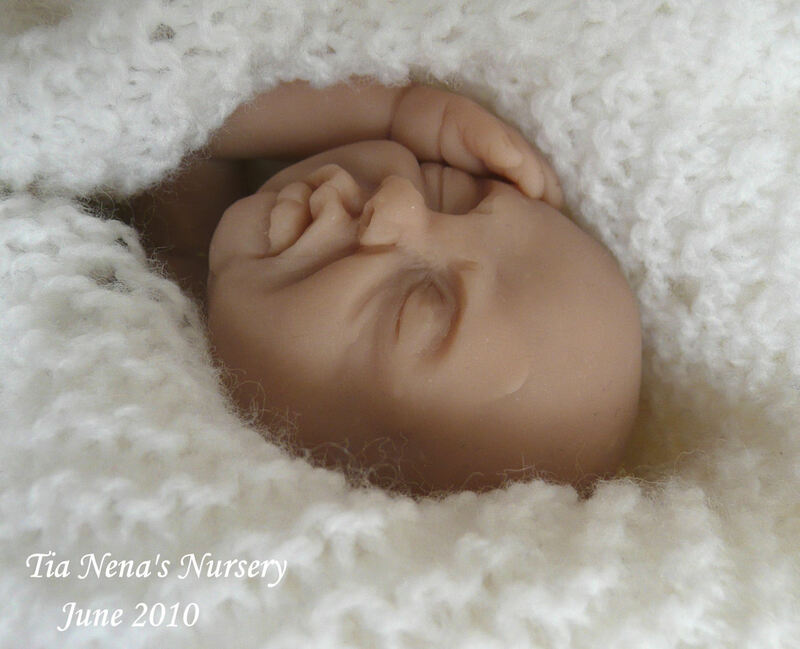 I learnt so much and it has really ignited my passion for sculpting. It is something I have always wanted to try. It is truly amazing to see a little sculpt emerging from the clay. 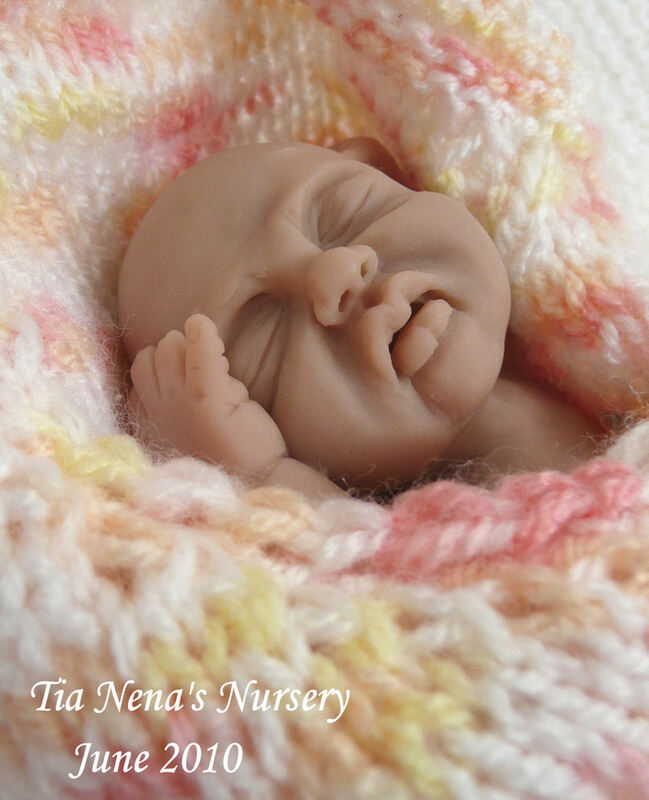 I'm really looking forward to making more babies (tee hee) and having a go at making 'cuties' that are more caricatures which I think will be more my style. 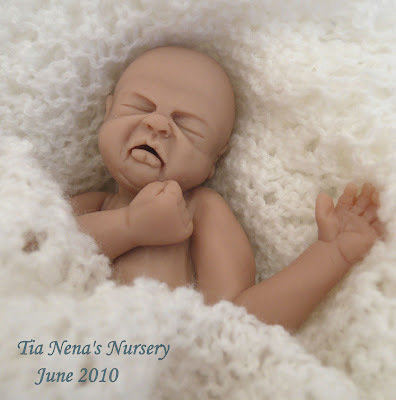 I'll be starting a separate blog for my sculpts to be called 'Tia Nena's Nursery'. I had a long think about what I would call the baby blog and all the cute names I could think of had already been taken. Even suggestions by the mastermind of Mr. Dry! So I decided to use a name that is personal to me. I have always been called Nena by my folks and others in my family. 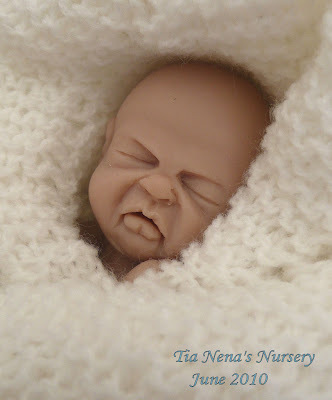 Since the age of 10 I have been an Aunty which is 'Tia' in Spanish. So for more years than I care to remember I have been called Tia Nena by my nephews and nieces. Although it may sound a bit weird... it's still very much me! I hope you like little Peter. Looking forward to reading your comments.